With over 100 members, Perth indie-pop choir Menagerie has no trouble filling an auditorium with harmonies. But what does it take to muster so many voices into a cohesive whole? Ahead of the choir’s sixth Fringe World show, Odes to the (In)significant, Seesaw chatted to Menagerie director Sally Banyard, AKA Zookeeper 3.0, to find out. Sally Banyard. Photo: Ian Crimp Photography. S: How did you come to be the director of Menagerie? SB: I joined the choir in mid-2015 as a humble alto, after being super-jealous of my friends who had joined the previous season and completely regretting my decision not to join when they did! 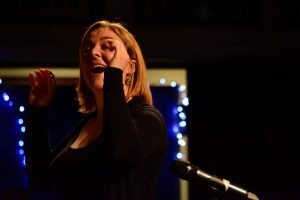 After my first season, I started writing arrangements – Silverchair’s “Freak” and Supertramp’s “The Logical Song” from for 2016 Fringe show Sounds Like Teen Spirit were my arranging debuts. In my third season I picked up a little conducting, and then when the time came for Zookeeper 2.0, Kate Newell, to have baby 2.0, I was chosen by the choir and its “control panel” (committee) to be Zookeeper 3.0! S: What is involved in being the director of Menagerie? SB: Quite a lot… but I love it! It’s a couple of roles in one – musical director plus administrator – I run rehearsals, conduct, write and edit arrangements, organise stuff and keep the choir informed about what’s happening, amongst other bits and pieces. Fortunately (and necessarily) I have a lot of help! Throughout the year I work with our “control panel” to run the choir – this group manages the day-to-day choir operations (like money, membership, media and parties…) and plans our non-Fringe shows. From about July to February of each year I work with an additional “creative panel” who create our Fringe show. S: What do you like most about directing Menagerie? SB: Rehearsals are always very fun, and satisfying – everyone is there to sing, learn and have a good time, and I love working together with the choir to make progress on our songs and sound each week. Gigs are also exciting – having it all come together and seeing the thrill of performing on everyone’s faces! Also, as a musician I feel very lucky to have a job where I have a lot of control over the music! S: And what’s the biggest challenge? S: What is the theme of your 2019 Fringe show Odes to the (In)significant? SB: Menagerie Choir’s Odes to the (In)significant celebrates tiny things that have a big impact on our lives. From small decisions made decades ago, to everyday subversions, these little things tend to accumulate and reverberate throughout our lives – often giving us courage, or speaking to who we are. For this show we have collected eight songs and paired them with little stories from within the choir – each exploring this idea in different ways. S: Can you give us any hints about the set list? SB: Maybe I should say different things each time I am interviewed and make this a “collect all eight”! Our set list is jam-packed with indie goodness, including favourites from Ben Folds Five, Regina Spektor and The Whitlams. In terms of the original recordings, there are five songs sung by female vocalists and at least four different nationalities, including 2.5 Australian artists… we’re slightly claiming Ben Folds but I’m not sure how he’d feel about that! SB: The slide (because we like glissandi). Menagerie Choir’s Odes to the (In)significant plays at Teatro at the Woodside Pleasure Garden from 11 – 16 February. Want to join Menagerie? There is a wait list – to add your name, use the website contact form. Pictured top: Sally Banyard conducting Menagerie Choir at Fringe World in 2018. Photo: Anthony Tran.